Louis "Lou" Freeman's list of "First Black to...." starts in high school. He and his brother were the first two Black students to integrate Woodrow Wilson High School in Austin, Texas in 1967. "we were the first Black students in the marching band and my brother was the first Black assistant drum major," he said. Lou Freeman also was the first Black ROTC cadet corps commander. After graduating in 1970, Freeman went to East Texas State University and again became the first, when he ended up being ROTC cadet corps commander again. He was a distinguished graduate in 1974 with a B.S. in Sociology and Psychology and was the first to attend Air Force Pilot Training. Blacks that graduated from Reese AFB, Texas out of an original class of 60. Freeman was assigned to Mather AFB in California to fly T 43s and again became the first second lieu- tenant to become a squadron scheduler and one of the first lieutenants to become an instructor pilot and supervisor of flying. He left the air Force in August of 1980 and was hired by Southwest Airlines three months later. Now is his 17th year with the company, "Southwest has been the perfect place for me," he said. "My job is like a hobby and the company's personality fits me like a glove". 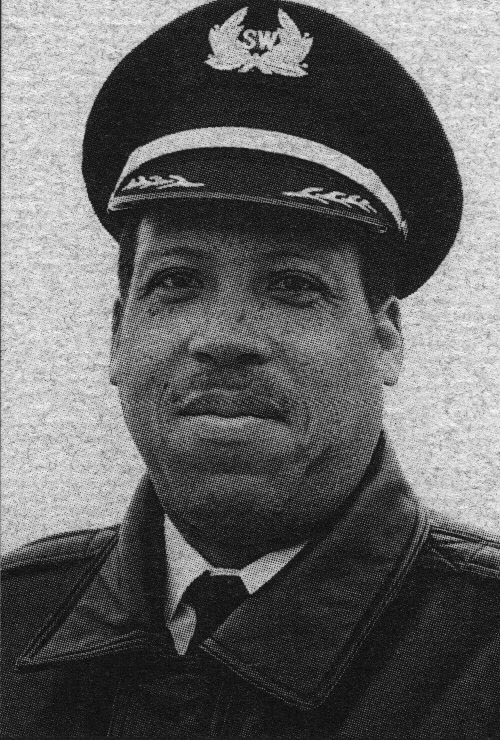 He was their first Black pilot and captain (the Airline now has 19 African American pilots with six as captains). "I just happen to be in the right place at the time Southwest was looking to open a new pilot base in Chicago and I was selected to be its first Chief Pilot. Freeman, with a Family of three, stays busy as head of the pilots. His duties include hiring and firing. giving evaluation flights in the air- craft and simulator; being the immediate supervisor to all pilots at Midway Airport; and interfacing with the City of Chicago and the FAA. He also helps determine company policy.